Owls have always featured prominently in the mythology and folklore of a variety of cultures. These mysterious nocturnal creatures are one of the oldest species of vertebrate animal, with fossils dating back 60 million years. 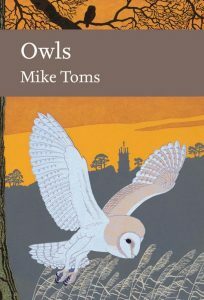 The much-anticipated New Naturalist volume on Owls by Mike Toms is the 125th volume in the series. When the series was founded in 1943, the then Editorial Board drew up a list of thirty possible titles. Of the original thirty, only Owls has escaped publication – until now, 71 years on. Owls have been a source of inspiration to writers, artists, historians and naturalists alike. Mike Toms draws on a wealth of experience and research in his volume on one of Britain’s most fascinating group of birds, providing a comprehensive natural history of British owls. Mike Toms is an ornithologist who has been with the British Trust for Ornithology since 1994. A strong advocate for ‘citizen science’ and the effective communication of science to a broader audience, he is the author of a number of books, including The Migration Atlas, and a regular contributor to BBC Wildlife magazine. He is a keen amateur naturalist in the traditional sense and likes nothing better than being out in the field.